Muscat : Indian Prime Minister Narendra Modi arrived here on Sunday evening on the last leg of a visit which also took him to Jordan, Palestine and the United Arab Emirates. "Landed in Oman. My first programme is the community event at the Sultan Qaboos Sports Complex. Looking forward," the Prime Minister tweeted. Deputy Prime Minister Sayyid Fahd bin Mahmoud Al Said led the welcoming party for Modi and his delegation on their arrival. # You all get a feeling of home in Oman. This is possible only because of the people and the leadership of this country. The Indian diaspora here are our ambassadors. # This is an era of India and the Middle East relations, PM Modi said, adding that the Royal family also shares a deep connection with India. 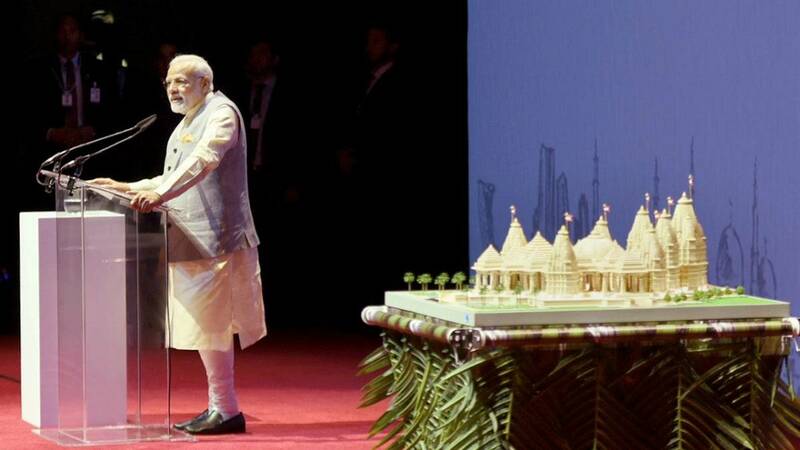 # Addressing the Indian diaspora in Muscat, PM Modi said, "Ten years ago, I was to visit Africa as the Chief Minister of Gujarat. I passed by Salalah, stayed there for some time, met some people and today I again got the opportunity to meet them. I wanted to visit Oman since a long time." # "Today, I am seeing a mini-India outside India. Desh ke alag-alag konon se aaye hue Bharatiye, alag-alag kshetron mein kaam karne wale Bharatiye ek bhavya tasveer ka nirmaan kar rahe hain," PM Narendra Modi has said.